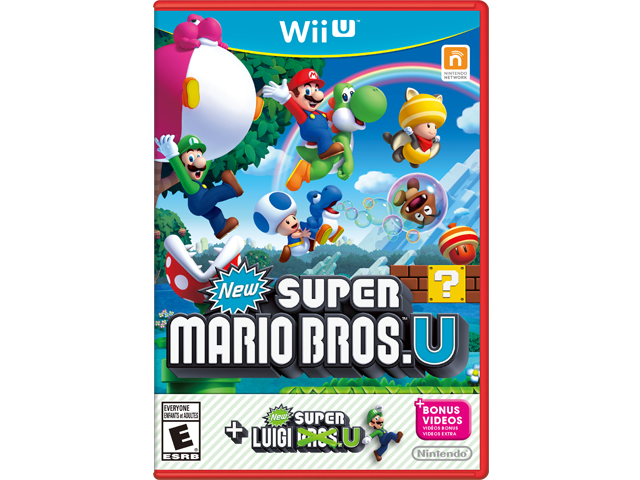 New Super Mario Bros.™ U is a new, side-scrolling adventure featuring Mario™, Luigi™, Toad™, … and your Mii™ character. Now’s your chance to step inside the Mushroom Kingdom and explore new worlds, new power-ups and new ways to play. Up to five players can jump into the fun, with up to four people using Wii Remote™ controllers and one on the Wii U™ GamePad. The experience is different, depending on which controller is used. Included on the same disc, New Super Luigi U! With Mario nowhere to be found, it’s up to Luigi to save the day in a brand-new downloadable adventure that takes place in the world of New Super Mario Bros. U. Experience new gameplay challenges as you guide Luigi, complete with his high jump and unique slide, through all-new courses. Enjoy high replayability and satisfaction from mastering each course. Up to five players can jump into the fun, with Nabbit taking the place of Mario as a playable character. Help Luigi finally prove he has what it takes!